I think most people have a list of what they plan on doing before they die. Whether it is a completely insane like hang-gliding off the Empire State Building or as simple as going to Italy I have always had a respect for those who at least value life enough to make a future list. We only go around this merry-go-round once (I think) so we should make the most of it. Really, this thought was inspired by the late, great Professor Randy Pausch. If you are not familiar with him let me catch you up to speed. He was a computer science professor at Carnegie Mellon until he was diagnosed with pancreatic cancer that metastasized through his body so rapidly, there was nothing that modern medicine could do but give him 3 to 6 months to live. Knowing his mortality he gave the most inspirational lectures that I have ever heard about living to live rather than preparing to die. He lived his last days the way we should live everyday. An amazing person. Here is a quick clip about Randy and I will post the entire lecture at the end of this post. Please watch it at some point. So here is my list of what I want to do before I check out. Some of these may seem ridiculous but it’s my list so back off! Just kidding. They may seem a little silly. 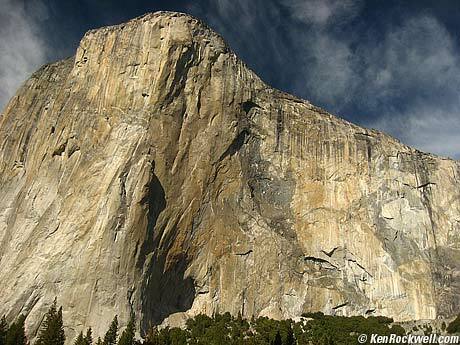 I want to climb El Capitan. Just the thought of standing next to this rock makes me momentarily lose bladder control. I have a long way to go for this so I am starting small. Yesterday I climbed onto the roof of my car. Learn the entire Thriller dance. Plus the “Moon Walk”. Qualify and complete the Hawaii Kona Triathlon. Pet a live Great White without losing a limb or cutting this list short. Perform the Heimlich on someone. That is depending on circumstance but if push comes to shove, I might just “mistake” someone as a choking victim just to knock this one off the list. Watch the space Shuttle take off from Cape Canaveral. See Iron Maiden, reunion of The Darkness, and Daft Punk in Germany. Get an IHOP sponsor for a relay eco-challenge team so I can legitimately claim we are powered by pancakes. Sing Flock Of Seagulls at a Karaoke bar in Key West, FL. Learn “Classical Gas” on guitar. Tell everyone I have wronged how sorry I am and tell my family that I love them all. Maybe have a kid of my own. Catch a home run from an opposing team and then throw it back onto the field. Read War and Peace, understand it and then teach it. Watch the F-14 fly again. Write my book and make it to some best seller list. Throw a paper airplane off the Eiffel Tower. Write a blog about a lot of nonsense. There are a lot more but that is what I have for now. I am sure most people would have more meaningful items but then again, I don’t live a life like that. You have to have fun. I think that is the secret to life. I wish I could have asked Jack Palance. Here is Professor Randy Pausch’s entire final lecture. Please watch if you have the time. It will be worth it. Loved the list. Hmm, I have the Thriller dance partially completed and apparently when I was three or four I told my dad’s secretary I could do the Moon Walk and would demonstrate it for her. Egads. Bill if I ever win my millions you and I are so gonna do some of these things together. I’d love to get close enough to touch a great white (and still have all my parts afterwards),learn the Thriller dance, watch the space shuttle take off, see the Aurora Borealis, and throw paper airplanes till they kick us off the Eiffel Tower! Great list my friend and I too will try to make time to watch the lecture sometime soon. I’ve seen the lecture. It was very inspiring. As for my list…I’ve never really sat down and wrote one out.I know there are quite a few things I’d like to do. But, I try to do as much as I can in my life. As long as I know I was the best person I could’ve been and was good to those close to me than that’ll be good enough for me. This is a great list. I saw a feature on Dateline or something about Randy Pausch so I’ve seen several of the clips. Never sat down to watch the whole thing though. I just remember expecting the last segment to be about how he died, and he hadn’t yet, and it was awesome. Classical Gas is the song they play on the Weather Channel all the time, isn’t it? During the weather on the 8’s? ooh, the Dead Sea sounds fun. My grandpa took each of his kids there before he died. Also, the northern lights are a common thing, in the frigid north, you just gotta come! Kristiane, where can you see the northern lights? I’d LOVE to see them but so far have no idea where to go. Do you have to go all the way to Canada or Alaska to see them? Streak somewhere… like Will Ferrell in ‘Old School’? Powered by pancakes would be the most awesome thing to say… love it! I have a similar list and just completed one major piece of it, which has to do with waxing. Not pleasant but necessary. I hope I never have to do the Heimlich, but I remember my mom doing it on Bluesuit when she was 2 and got a lifesaver stuck in her throat. I saw some of his speech before he died – truly inspirational. One thing I want to do is understand how the moon the sun and the earth can align to create the phases of the moon we see every month. Great list! Regarding the Heimlich, maybe you should consider ‘something’ instead of just ‘someone’. I had to give my dog the heimlich (for swallowing a rawhide chewie whole) and I felt pretty good about that afterwards. I am going to come back and watch the video when I have a few minutes. Somebody emailed it to me at work a while back, but I didn’t watch it for fear of blubbering like a baby on the job. I cry easily making-life-count kind of matters. Correction Pammy Girl – it wasn’t me that choked on the lifesaver. I just called Mom b/c I had never heard that story before and it turned out it was Lynne. Blue: I demand a YouTube video of the Moonwalk. KB: Sooner than you know. ScoAmer: Glad I could help out. I saw the shuttle take off from my backyard at night when I lived in WPalm. It was amazing. You could hear the entire city applaud and shout. Really a goosebump moment. Pammy: You too. I want to read your list. And yes. just like Will Ferrell. Mike: That’s very interesting. I have no idea! And I’ll be posting the award this week! Thanks again! Definitely watch. It’s heart warming, especially for a parent. I think Matt would enjoy it from father aspect. BLUE: Uh Oh. No deathsaver for you? Makes you wonder how many people have died on Lifesavers. Pretty ironic, don’t you think? This is a great list, not silly at all. And I wanna be there when you sing Flock Of Seagulls. 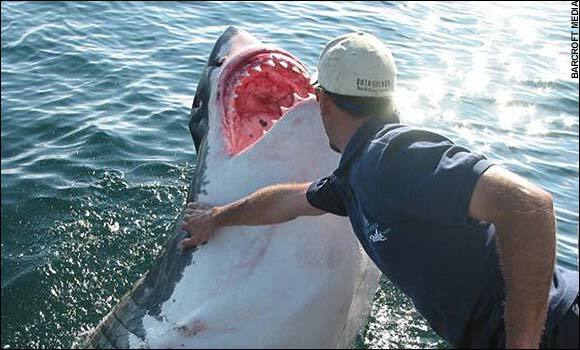 Take me with you so I can “pet” this shark too..
Dan: You are on my friend! If I win first I’ll take you pal. JoshC: Dude, I tell you, we could clean up on some Karaoke. Time and space, no matter!